We were so impressed with Drupal‘s new theme, that we decided to port it to WordPress and let everyone here have at it. So here it is: Garland a.k.a “Themetastic” by Stefan Nagtegaal and Steven Wittens. Garland is a great, three column, widget friendly theme in soothing blue, but what we think you’ll really go gaga for is the color customizer that comes with it. Not feeling so soothing? With just a few clicks, you can change to sandy earth tones, gothic black or that electric pink look you’ve been wanting for so long. Got school pride? Try out your school colors. Go patriotic. Go ghastly. Whatever, go crazy! On another note, we’re curious which color picker you like better: the one available in themes like Kubrick that offer a custom header, or the one in in this theme. Feel free to let us know which and why in a comment here. OMG — I LOVE the new theme Garland!! I just activated it and customized my sidebars, header colors, etc. TOTALLY me!! Thanks so much. I don’t think I’ve ever used the color picker in any theme but this one, but I will say I like this one! I can use the hexidecimal equivalents OR click on the circle and/or box inside and get my color. The fact that it previews is great so i can see what it’s going to look like before I commit to anything is nice also. Thanks for a great theme!! Thank you for the new theme. It combines my two favorite characteristics of a theme into one: the freedom to choose colors and three columns. The possibilities are endless. This will be fun to play with in the next few days. Now if this came with the ability to use a custom banner…well, it would be what I have been looking for! Could you give me an example of a post of yours on which this disappearing image bug happened? You can either write back here or send us a feedback. So isn’t this part of the Drupal core 5 theme? who is borrowing the theme from who? is the theme open source? Seems kind of strange that WordPress would make this available when it was a major feature of the yet unreleased Drupal 5. Maybe I will go over to S. Wittens page and read more about this. Great! it is changed now! 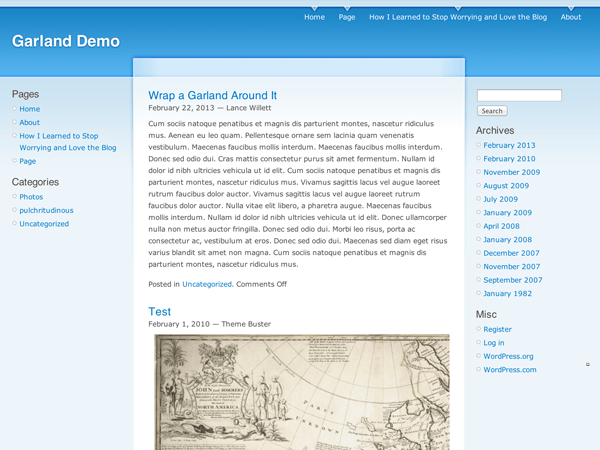 As the post mentions, this is a Drupal theme that we’ve ported to WordPress. Everything is open source. Such a great theme deserves a lot of exposure! YAYAYA purples and greens here I come!! I love this one! I cant wait to go to sleep so I can wake up in the morning and get it all purdied up! Thanks! mdawaffe – I immediately switched over because I really liked the look of this new theme and noticed that the images on my most recent post (which are uploaded to wordpress) were not showing as described. Images in the previous two posts which are linked to instead of uploaded were ok. So I switched back to my old theme but I really liked the colour thing and the blue and 3 columns layout were very good. Nice.. If only it had a custom header…. Nice. It’s changed, but with a few problems changing colours. For the rest is great! Hmmm. Excellent text side-bar layout but no custom header. boo hoo. Finally a 3 Columns Theme. But I agree with axewielderx, a customizable header would have been more stunning. Thanks for this new Theme tho’. this is fantastic thanks again, you guys! swell idea the color picker. but useless to me in the end since it doesn’t opt for a custom header. The theme looks lovely but still,a customizable header could make it very good.Everyone wants to have individuality in their blogs and that’s where the headers come in. Yes, I agree, great theme thoughh. Oh wow that is a rocking theme, I am impressed once again. Glad to see that there are more and more 3 column themes coming. Really appreciate your work. Noob question, so I apologize upfront. But WHERE/HOW is this theme to be downloaded? that’s a great idea! customizing your own colours… gd work. but not much customisation. i’d use it if i could customize it, like the headings, etc. The color picker doesn’t run fine. love it..thanks a lot guys.. I love the new theme, and it makes a good theme for christmas colors (green and red). My blog has now the perfect theme for holidays. Very nice. However I am having some problems with changing the colours. To my taste, this theme is the best so far. I played around with the colors and got a nice, soothing look (which does a good job of softening the sometimes outspoken tone of my articles). So “Garland” Plus the soft ambient sounds of “SongSpot” just made my day!! Everyone is welcome to see what it looks like on my site, along with my new Christmas posting of Renegade Christmas Poetry. Another great theme! Let’s have more coming, please! but I can’t use it because there is no style for PRE tag.. Some of my long coding are not showing in this theme.. It would be great if someone add a style for PRE tag. Thanks. err, why can’t I change colors? I go to customization options, pick the colors I need, click “save colors” and the page refreshes but the colors are the old one…why? I am still unsure if I will switch, the theme is great! However, the color picker does not work for me ATM (changes do not get saved, after clicking the save button I get the original colors again). i agree with the custom header. the color picker works great, but i would love to also be able to choose a header. and i love the 3 column layout, one on each side. I love it! But I do agree a custom header would make it so much nicer. now we’re cookin’… excellent! it is always easiest not to reinvent the wheel… no doubt someone has tackled the same needs before… like others, would love to be able to change the colour of the header… is the most public statement of a site, that tweak and I would soon be a proud switcher! This looks like the theme I have been waiting for. Many thanks you clever people. This is indeed a fantastic theme and I intend to try it! Cool! Will be trying it out! absolutely the best i’m sure! When I try to set my own colorset it back to default. Where is the problem? Would love to see support for the tagline, or a custom header, and also a way to remove the author’s name from every post/page. Very nice temlpate. Love, love, love the columns on each side. Now, if it had a customizeable header, it would be the most perfect template ever. Thanks for a great theme. Giving the end user more choice and greater range for creativity is always a good thing, IMHO. It would be fabulous to be able to have a custom header as well as the color control; after all, the custom header is the most creative tool we have at our disposal to express our individuality. Thanks for great idea of creating for others! This theme is fantastic! It’s clean, allows for good content, and can still look pretty :). Appreciate all the work WordPress guys. Love you guys at WordPress! The color picker is SO awesome, but I can’t make it work. No matter what button I press, both of them work as “Return as Default Colors”. I would really like a green-based theme with orange links, but can’t chage it. Could you guys lend me a hand? I’ll head for the Feedback form in the dashboard. But the theme is awesome and I’ll stick with it even if I can’t change the colors! Loving the color picker situation! Altho, reading the comments by my wordpress “community” that the header isn’t customizable. I’m just betting the farm that the WordPress Wizards are all ready ALL OVER THAT. Thanks wizards, you never cease to amaze me. I’m off to water the witch. Perfect! Except…I’ll echo everyone else…a custom header with this theme would rock. Love the 3 columns and the custom coloring, but I’ll stick with my current theme because of the custom header. woohoo! Very cool looking. I vote for adding a custom header option to it. Keep up the good work, wordpress. We luv ya! if only we could put a custom header at the title bar… but that’s just me being overly nitpicking. The color selector is huge for wordpress.com!! I’d like to see that on other themes. It looks great. Is there any chance of adding a page template to change the layout on other secondary pages? I also lost the Home page if I clicked on one of my pages is there a way around that? Really cool theme … using for my personal blog now. Tnx. I have been wanting a good 3 column theme, that is not boring and dark. This theme gives me the option to “Change it Up” while enjoying the flexibility that I need with the three column layout. I have to agree that it could use a custom header option. Thanks for all you guys do here at WordPress. This is one of your better ones! I like it a lot, and if you add a custome header, it would be perfect! Hot pink, here I come! One more plug for a custom header! Simply changing the colour scheme doesn’t really say that much about you or your blog. Up at WP Theme if anyone wants to kick the tires. sorry for being thick: but how does one check it out without activating it? I love this new Theme. I activated it immediatley after reading this entry. I love how everything looks sooo clean. I haven’t fiddled with the color picker…yet…but I will soon. Thanks to WP for such agreat service and thanks Stefan Nagtegaal and Steven Wittens for such a great theme! I like this color-picker better than the other. Garland is a great theme, but bulletted lists don’t seem to work correctly. Oooohhh…. I like! But yes… a customizable header would be a very nice addition. Very nice, very nice. Me like. But any chance of a custom header? Love having choices!! Very cool! Awesome! I love it! THANK YOU! I really, really want to use this theme, but I think there are a couple of bugs in it. First, most of the pictures in my posts disappeared. Second, the bullet-points for the lists on the sidebars don’t seem to be working very well.